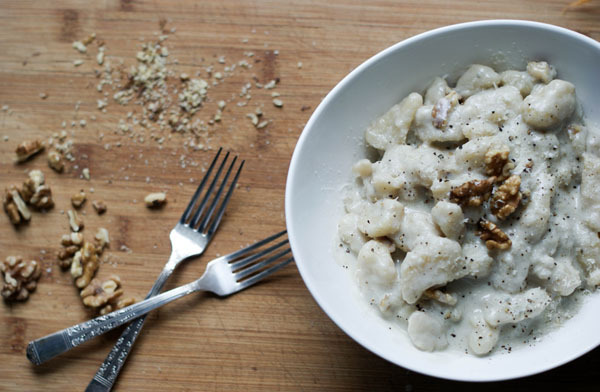 Gorgonzola and walnuts is a great combination. 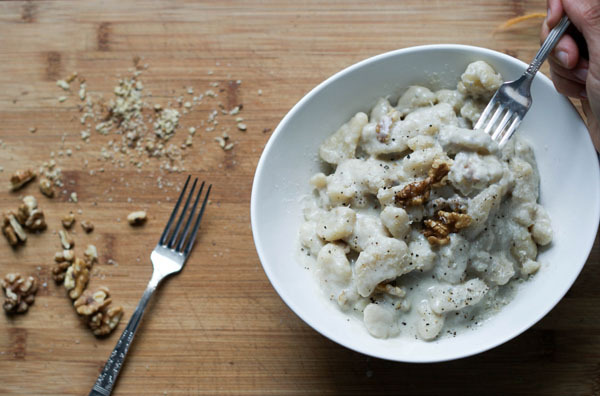 The pungency of the cheese, the earthiness of the walnuts, with just a hint of cream makes for the perfect sauce for the gnocchi. I did not make the gnocchi by hand, let me just say that. I made them only once in my life, many many years ago, and they were so soft that when I put them in the boiling salted water they just huddled together forming and indistinct blob of some sort. My mom and my aunt are the ones that make good potato gnocchi, but until few years ago they were not my favorite pasta. They were usually made on Thursday, Giovedi’ Gnocchi, according to an old custom that you find in the Roman area. Gnocchi on Thursday are followed by Fish on Friday and Tripe on Saturday 🙂 . In some typical “osterie“, the tradition is still strong and you are more likely to find those dishes in the menu of the day. Anyway, in my childhood and teenage years, I dreaded the Thursdays for fear to find a plate of gnocchi waiting for me after school. And for many thursdays that was the case (luckily for me not too many ’cause my mother worked at that time). Slowly I started to develop a taste for them, up to that day when I tried to make them from scratch. And the vision of that floating mess in the pot hunted me for years until I surrendered to the fact that maybe gnocchi making is not for me, I’ll leave it in the hands of the pros, but I can still enjoy a good plate. Especially with white sauces instead of red ones. Gorgonzola and walnuts is such a great combination. 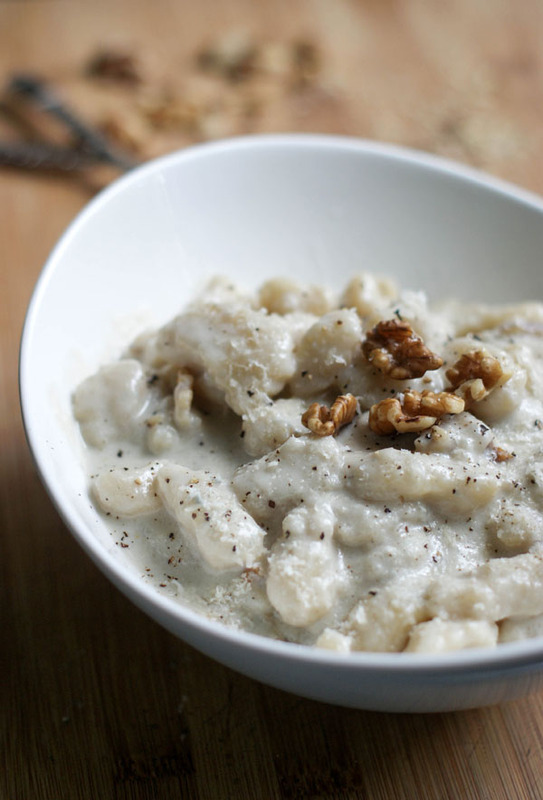 The pungent nature of the cheese and the earthy base of the walnuts, with just a drop of half and half cream, create the perfect sauce for the absorbent texture of the gnocchi. Ravioli, gnocchi, pizza are the 3 best ways to enjoy the marriage of flavors. 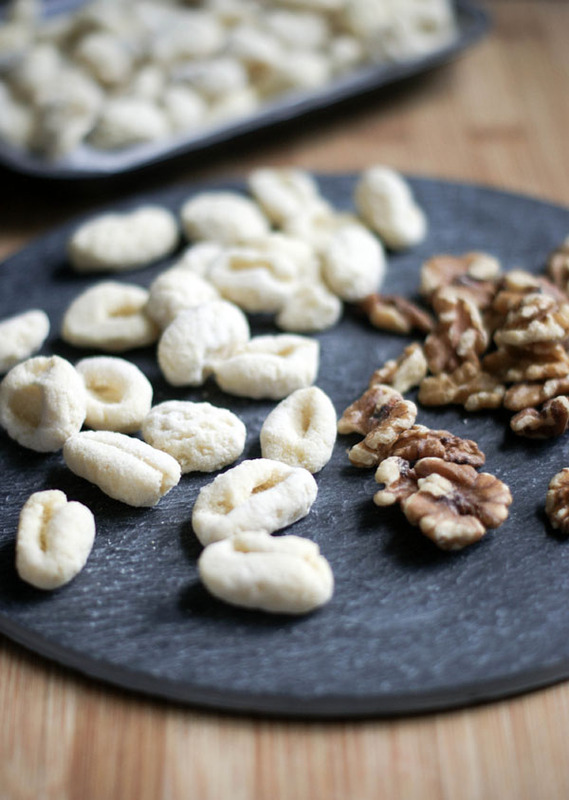 of the gorgonzola and walnuts. The amazing taste of this dish is enhanced by the quality of the ingredients (once again few but good): gorgonzola cheese from Cavern (a great place to go to find quality cheeses from all over the world), gnocchi from Pasta by Caterina at City Market Downtown, half and half cream and walnuts from our local organic food store. 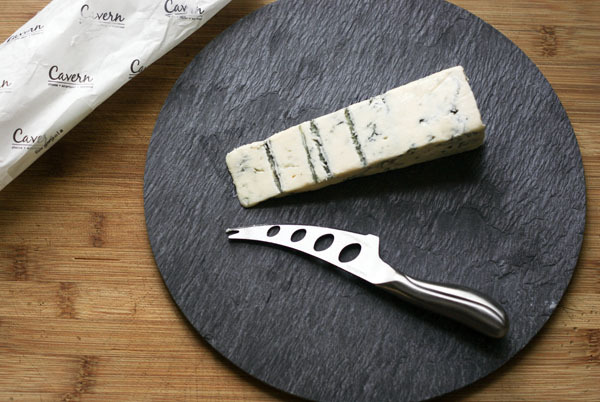 I know that gorgonzola is an acquired taste, but if you feel adventurous give it a try, you may just like it. My husband is not a fan of blue cheese like me, and if having two servings is an indication, then I think he may have changed his mind about gorgonzola 🙂 . In a pot brings 6 cups of salted water to boil. In the meantime, warm up a sauté pan on low heat, break up gorgonzola and place it in pan. Stir with a wooden spoon and as gorgonzola starts to melt slowly add the half and half cream. When all the gorgonzola has become creamy add the chopped walnuts and remove from heat. Place gnocchi into boiling water and when they all come to the surface (about 6-8 minutes) scoop them up with a strainer and place them delicately into the creamy sauce mixture. Coat gnocchi with sauce, tossing gently. Plate gnocchi and finish with some grated parmigiano and fresh cracked black pepper. Riempite una pentola capiente con acqua e portate ad ebollizione. 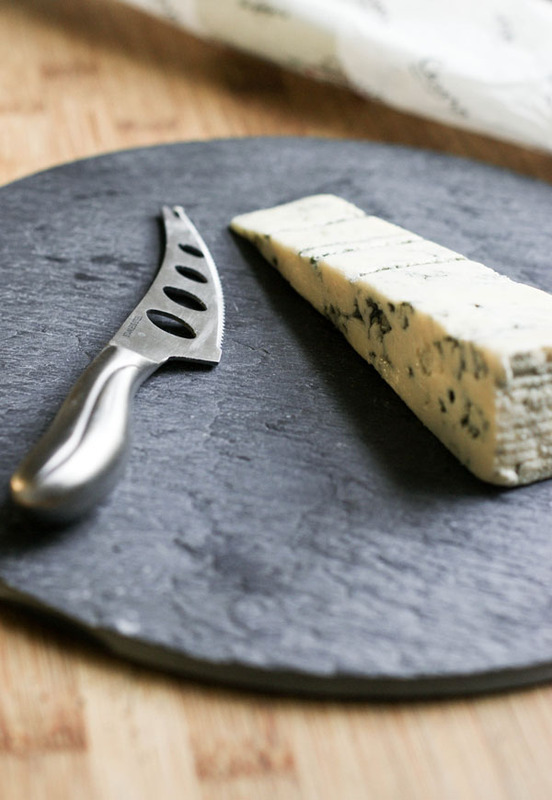 Nel frattempo in una padella antiaderente spezzettate il gorgonzola e fatelo sciogliere, mescolando con un cucchiaio di legno e aggiungendo la panna. Quando il gorgonzola è diventato cremoso, aggiungete le noci tritate e rimuovete dal fuoco. Versate gli gnocchi nell’acqua che bolle e quando tornano in superficie, dopo circa 6-8 minuti, scolateli e posateli delicatamente nella padella con la crema di gorgonzola. Mescolate sempre gentilmente per condire tutti gli gnocchi. Impiattate e completate con un pizzico di pepe, una grattugiata di parmigiano e qualche gheriglio di noce.